The meta title of your page has a length of 54 characters. Most search engines will truncate meta titles to 70 characters. 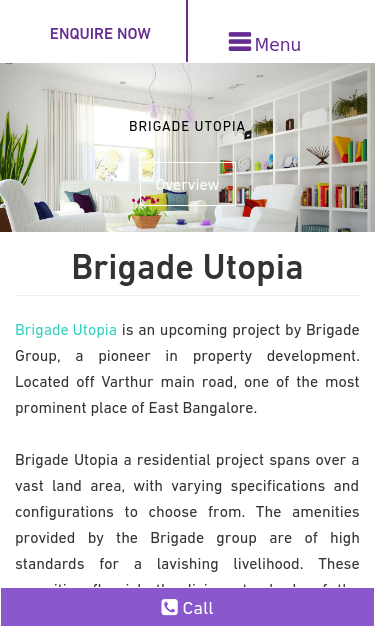 Brigade Utopia is a new Pre Launch Project By Brigade Group; Location Varthur Road, East Bangalore. Location Map, Price, Floorplan, Masterplan, Amenities, Reviews. All of your webpage's "img" tags have the required "alt" attribute. Congratulations! The size of your webpage's HTML is 7.93 Kb and is under the average webpage's HTML size of 33 Kb. Faster loading websites result in a better user experience, higher conversion rates, and generally better search engine rankings. Congratulations! Your webpage is successfully compressed using gzip compression on your code. Your HTML is compressed from 40.11 Kb to 7.93 Kb (80% size savings). This helps ensure a faster loading webpage and improved user experience. Your website loading time is around 3.08 seconds and this is under the average loading speed which is 5 seconds. Congratulations! Your webpage is using cache headers for your images and the browsers will display these images from the cache. Some of your website's CSS files are not minified! http://www.brigadeutopia.net.in and http://brigadeutopia.net.in resolve to the same URL. Your website is not using https, a secure communication protocol. Even for sites that do not collect sensitive customer information, search engines suggest that switching to https is an increasingly good idea and may help improve rankings. Note: if your site relies primarily on adsense income, be aware that using https may be detrimental to ad earnings. Your webpage is using the canonical link tag. This tag specifies that the URL: http://www.brigadeutopia.net.in is preferred to be used in search results. Please ensure that this specification is correct, as canonical tags are often hard-coded and may not always reflect the latest changes in a site's URL structure.